You've probably seen them, perhaps on long roadtrips: wind turbines with enormous, hypnotic rolling blades, harnessing the clean power of wind for conversion into electric energy. What you may not know is that for the explosion in the number of wind turbines in use as we embrace cleaner sources of energy, these wind farms are quite possibly not as productive as they could be. "We've been designing turbines for use by themselves, but we almost never use them by themselves anymore," said UC Santa Barbara mechanical engineering professor Paolo Luzzatto-Fegiz, whose specialty lies in fluid mechanics. Historically, he said, wind turbines were used individually or in small groups, but as the world moves toward greener energy technologies, they are now found in groups of hundreds or thousands. The problem with these large installations is that each machine, which has been designed to extract as much energy as possible from oncoming wind, may not "play well" with the others, Luzzatto-Fegiz explained. Depending on how the turbines are situated relative to each other and to the prevailing wind, those not directly in the path of the wind could be left to extract energy from significantly depleted airflow. "These turbines are now very good at extracting power from wind, but they also form these very big wind shadows," said Luzzatto-Fegiz, who is the lead author of "Entrainment models for fully-developed wind farms: Effects of atmospheric stability and an ideal limit for wind farm performance," published in the American Physical Society journal Physical Review Fluids. Similar to how structures can attenuate the flow of light from one side to another, wind power also is lessened as it flows from the front of the turbine to its rear. The result is that not all turbines in a wind farm are living up to their potential. "So, you can see that it's not a matter of packing more turbines on your piece of land, because at some point you hit these diminishing returns," he said. "There's a point where if you keep adding turbines the amount of power you get becomes less." However, according to Luzzatto-Fegiz and co-author Colm-cille P. Caulfield, a professor at the University of Cambridge in the U.K., there are ways to get around this issue of diminishing wind returns. And, they said, these enhancements could result in orders-of-magnitude improvements in the energy production of wind farms. The main goal, according to the researchers, is to give all turbines access to high-velocity airflow, from which they can extract a greater amount of energy. Since the wind above the farm is much faster than between the turbines, mixing the airflow in the wake of the turbines with the air above could be the key to getting more bang for your wind turbine buck. "If you could somehow invent a gadget that for each of these turbines causes these wakes to mix very quickly, you can potentially have these huge improvements," Luzzatto-Fegiz said. Yet another potential solution is a relatively new version of the wind turbine, in which the blades rotate on a vertical axis—like eggbeater blades—as opposed to the traditional horizontal axis. "These don't perform as well ordinarily by themselves, but it's significant that they essentially can cause much stronger mixing in their wakes," he said, "and people have shown that if you put them in an arrangement where they spin in opposite directions to each other they can cause very nice mixing." 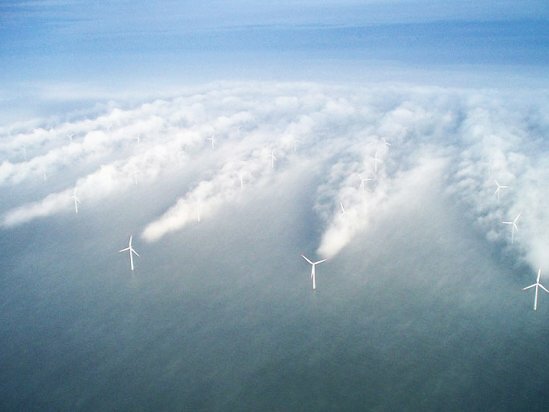 The models developed by the researchers could lead to better-performing wind farms, which in some cases may not require as many turbines as previously thought, thereby reducing potential costs. The models also could result in custom solutions that involve the farm sites' specific terrain, and local weather patterns. "We're really excited that we can model all that very accurately," said Luzzatto-Fegiz.